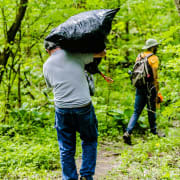 Trail Maintenance- The Edge of Appalachia Preserve is one of the most biologically diverse collections of natural systems in the Midwestern U. S., encompassing rugged woodland, prairie openings, waterfalls, giant promontories and clear streams. We need your help in regular monitoring and upkeep on the trails throughout the year. If you have the skillset to repair water bars and re-bench worn sections of trail, or if you’re able to commit to hiking a trail and reporting back to staff on fallen trees blocking the trail, we need your help in maintaining and improving the hiking trails at EOA. Prescribed Fire Volunteers - As part of an integrated land management philosophy, the Edge of Appalachia utilizes prescribed fire in order to support our management goals. We need volunteers to accomplish this mission. TNC in NW Ohio annually offers the required trainings that allows people to participate in prescribed fire; unfortunately no trainings are currently offered at EOA. While we cannot be burning all times of the year our typical timeframes are mid-Feb - early May and Sep - early Nov.
Land Management Volunteers - During the growing season TNC can use your help to fight off invasive species that are highly detrimental to the success of our natural communities. Using various methods including chemical applications and mechanical removals, we will prevent many of these invasive species from taking over the spectacular natural areas that make up the Edge of Appalachia. Biological Monitors - Knowing how the natural communities are responding to our work is important to the success of our projects. There are monitoring projects going on throughout the growing season (May-October), that include vegetation monitoring within prescribed fire units and photo plots of our 131+ prairie openings. Other projects are currently in development to expand volunteer engagement in current monitoring protocols that include reptile, wood rat, bat, and other animal and insect monitoring. Data Entry: Part of the workload for the 20,000 acre EOA preserve system is recording and tracking all kinds of data. This ranges from entering research publications performed on the EOA property into our local database, scanning in photo slides from decades of naturalists’ keen eyes for the rare and unique fauna and biota of EOA, to helping track hiking visitor logs or deer hunter permission forms. If you’ve got a knack for data entry and want to get your hands on the history of EOA, we’re in need of your help. To sign up for a specific project or workday, contact Volunteer Coordinator Angela Burke at angela.burke@tnc.org or 614-717-2770 x144 and indicate the project location(s) and date. Once you sign up for a project you will be connected with regional staff and/or leadership volunteers who will provide you with all necessary details to the project date.